Unable to decide on establishing a “European Border and Coast Guard”, EU leaders on Thursday (18 December) tasked the incoming Dutch Presidency to move forward with the divisive issue. EU leaders made little progress to shape the common policies needed to respond to the unprecedented migrant crisis. The most important deliverable expected from the summit was the “European Border and Coast Guard” proposed by the Commission on 15 December, that could intervene even without the host country consent. According to the Council conclusions, the 28 EU member states should adopt a common position on the “European Border and Coast Guard” under the Netherlands Presidency, in the first half of 2016. “We are failing to protect our external borders”, Council President Donald Tusk admitted, speaking to the press past midnight on Friday, at the end of the first day of the summit. Tusk said the leaders’ most important decision was to protect Schengen, the EU’s borderless space, which is under the risk of being dismantled. Judging by the declarations made by EU leaders before the summit, France, Germany and Bulgaria approve the Commission’s proposal, but several other countries remain opposed to abandoning their sovereignty and surrendering to what a diplomat called “the invasion clause”. Swedish Prime Minister Stefan Löfven said before the summit that controlling the borders is a national responsibility, and so did his Danish colleague Lars Løkke Rasmussen. Although Denmark has an opt-out on Justice and Home Affairs, he said his country would oppose a system where the EU would tell it how to manage and protect its borders. EU leaders also proved unable to progress over the issue of who will pay the €3 billion promised to Turkey at the 29 November EU-Turkey summit. Initially the idea was that the Commission would provide €500 million and the EU countries the remaining €2.5 billion, the burden-sharing being based on the usual distribution key according to GNI. But before the summit, diplomats mentioned higher figures for the contribution from the EU budget. 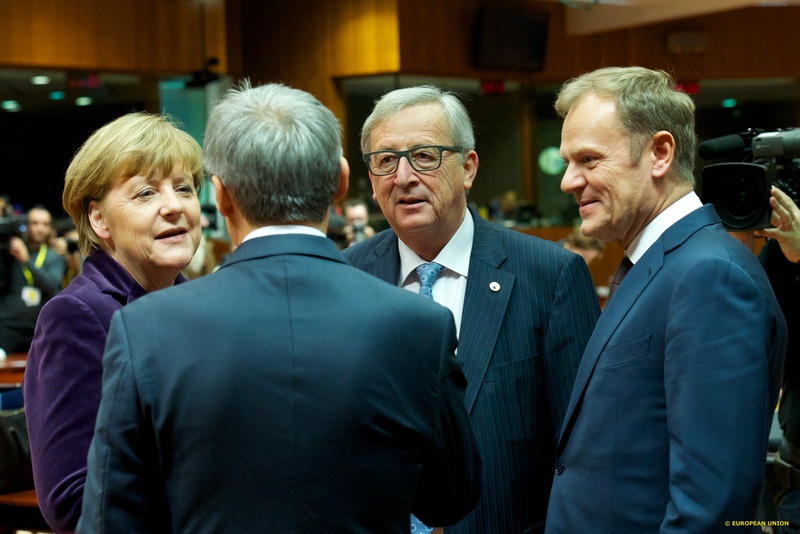 Now EU leaders tasked their ambassadors with negotiating a solution. Leaders decided also to address deficiencies as regards hotspots, relocations and returns. Out of the 160,000 migrants which they decided to relocate from Greece and Italy last September, only around 200 have been moved to other countries thus far. EU leaders also tasked the Commission to “rapidly present” a review of the EU’s asylum system, which has proved to be unable to function in the conditions of a massive and constant arrival of candidate refugees. In the meantime, existing rules must be implemented. A “voluntary humanitarian admission scheme” is to be put in place, based on decisions by the so-called “like-minded countries”, some of which are willing to take migrants directly from Turkey. German Chancellor Angela Merkel said she was optimistic following a mini-summit held the same morning with Turkish Prime Minister Ahmet Davuto?lu and several EU leaders. However, the first Implementation report following the EU-Turkey summit, obtained by EURACTIV, reveals that the number of migrants arriving from Turkey to Greece since then has basically remained unchanged since mid-November. The arrivals number averages around 3,000 per day. Czech Prime Minister Bohuslav Sobotka said many member states did not consider the EU-Turkey Action Plan, agreed on 29 November, as a success. Czech diplomats added that “people in Brussels” judge the implementation much more positively. A diplomat also said he had received positive reactions for his initiative to create a group called “The Friends of Schengen” and had received several positive reactions to the letter he had sent to EU leaders. He added that his delegation was happy from this effort to curb the usual labelling of the Central and Eastern European countries as troublemakers when it comes to migration issues. Speaking after the end of the first day of the summit, French President François Hollande said that money would be disbursed to Turkey only if the needed criteria would be met. For her part, German Chancellor Angela Merkel said the Union needed to learn and adopt new mechanisms. “We cannot leave this just to Italy and Greece. We have to help each other. We have had this problem for four or five months. For many other issues that were important, we needed years,” she said. I guess they are relying on the expertise gained from Srebrenica? The Dutch are well experienced in fighting or pushing back every other country with improper intentions but despite that have always maintained an inclusive, tolerant and cosmopolitan outlook. They might well be the best candidates for looking after Europe’s borders.